Washington (CNN) -- Survivors of the oil rig explosion April 20 that triggered an underwater oil gusher in the Gulf of Mexico, along with the father of a man who died in the blast, urged members of a House committee Thursday to hold Transocean and BP accountable for the incident. 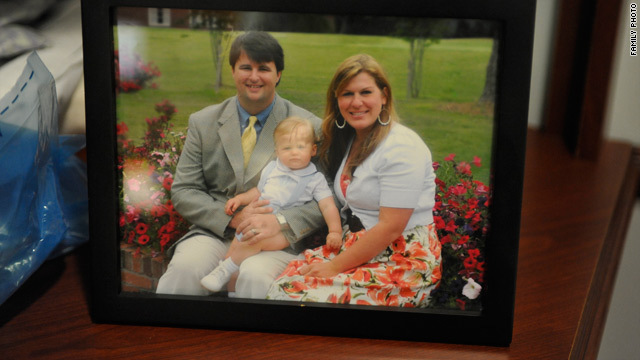 "Please believe me, no amount of money will ever compensate us for Gordon's loss," said Keith Jones, a Baton Rouge, Louisiana, attorney whose son, 28-year-old engineer Gordon Jones, died in the explosion on the Deepwater Horizon off the coast of Louisiana. "We know that. But payment of damages by wrongdoers is the only means we have in this country to make things right." Two employees of rig owner Transocean, meanwhile, accused the company of putting profits above lives and cutting back on safety and employees leading up to the explosion. When workers complained of needing more help, "They just kept telling us they'd see what they could do," said engineer Doug Brown, 50, of Vancouver, Washington. Brown suffered head and leg injuries in the explosion and said he now struggles with short-term memory loss and post-traumatic stress disorder. Employee Stephen Stone told committee members that the explosion "was hardly the first thing to go wrong" on the rig. Both men described a horrific scene on board the Deepwater Horizon the night of April 20, with people crying and screaming for help as others scrambled for safety. "I was pretty certain I was going to die," Stone said. Video: Should military take over in Gulf? After making it onto a lifeboat, being rescued by the Coast Guard and reaching land, some 28 hours after the explosion, survivors "were lined up and made to take a drug test" before being allowed to leave or call their families, Stone said. Transocean asked him to a sign a document -- without his attorney present -- saying he was not injured in the blast in exchange for $5,000 for the loss of his personal possessions, he said. He refused to sign the portion saying he was uninjured, he said, because even though he did not require medical treatment at the time, he must see a doctor for effects of smoke inhalation and is also dealing with mental and emotional aftereffects. Legal representatives for both BP and Transocean said the companies are making payment of claims a priority. "We are going to pay all legitimate claims," said Darryl Willis, vice president for resources for BP America, who is handling claims against the company. "We realize that we're going to be judged by our response to this spill, and we're going to pay for all damage to people, to governments, to the community." BP has already paid out some $37 million in claims, he said, and has opened claim centers in Gulf Coast states. But Jones argued that the federal Death on the High Seas Act unreasonably limits the damages surviving family members can receive. He said the situation makes even less sense considering it was modified after the crash of TWA Flight 800 in 1996 to help the families of air crash victims recover damages. In one of the last pictures taken of Gordon Jones, he was giving his 2-year-old son, Stafford, his first golf lesson. His second son, Maxwell, was born two weeks ago, with his father represented in the delivery room by a family photo. 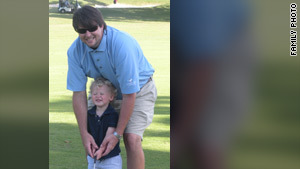 "There's nothing in the High Seas Act that can compensate the loss of a golf teacher," his father told CNN after the hearing. "His sons are not going to have someone to teach them to give a man a firm handshake and look them in the eye." He said his son's wife, Michelle, "cannot recover for the loss of the love of her life." "The loss of Gordon's income is the last thing Michelle grieves for," he told Congress. "When Michelle tells her boys about their dad, she is not going to show them a pay stub." But under the current law, he said, that is all she and the older son are entitled to, and the baby may be entitled to nothing, because he was born after his father died. In one of the last pictures taken of Gordon Jones, he was giving his 2-year-old son, Stafford, his first golf lesson. Jones said allowing punitive damages against companies like BP and Transocean is "the only way they may learn." Mississippi Attorney General Jim Hood told committee members that Transocean has already filed a limitation action in preparation for lawsuits, and BP has filed to consolidate such suits. States are concerned they will be pulled into a class-action suit where they will be treated like any other plaintiff. Mississippi wants its legal issue debated in state court, not in courts somewhere else, he said. Transocean attorney Rachel Clingman said the majority of about 120 suits filed against the company thus far are class-action suits. Multiple lawsuits are confusing and can lead to disparate treatment for plaintiffs, she said. The company filed its limitation action for several reasons, she said. "We believe that it is important to have a central venue for these actions and to maintain a degree of continuity and consistency in awards to plaintiffs that would not be possible if lawsuits go forward in courts throughout five states in various state and federal courts." Asked by Rep. Sheila Jackson-Lee, D-Texas, about Stone's claims he was asked to sign a document, Clingman said a man "who is not a lawyer" met with Transocean employees in the days after the explosion and gave them a $5,000 check for their possessions. "No release was signed," she said. "No one has been asked to, or has, signed a release of liability," she said.